Beyond These Dark Lands Are Edges Of Joy: The Author Explains the Meaning of the Poem, His Place. His Place, A Poem of Renewal, is found on page 9 of my book, Beyond These Dark Lands Are Edges of Joy, Words of Comfort and Hope. I wrote this poem to inspire people that in the trauma of difficulties we can find peace in God but we must seek Him. This is one of the more simple and obvious titles. The phrase, His Place, directs us to look to The Lord. Of course, Place is not a physical location but a spiritual one. The subtitle, A Poem of Renewal, is very important because that when we spend time with The Lord we are renewed and able to live in the world victoriously. are Edges of Joy, Words of Comfort and Hope. The poem turns from describing this spiritual place to the blessing we find there, the blessing of Him... that is from being in God's presence. We must be devoted to finding God, even in difficult times. If by faith we meet with Him we will carry His peace through our day. 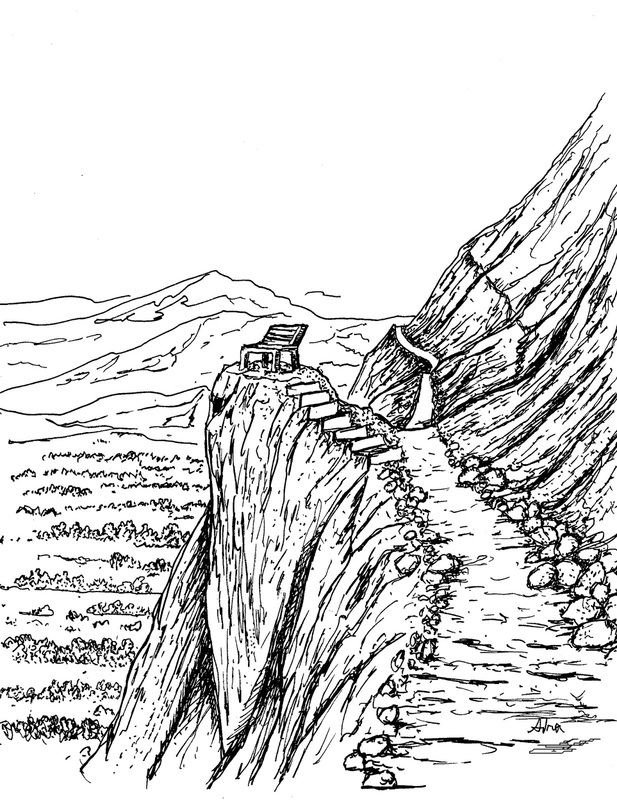 The picture I drew for this is a path leading up the side of a hill where a bench sits on an outcrop of rock that overlooks the landscape below. It is an attempt to illustrate a quiet place where we might meet with the Lord. 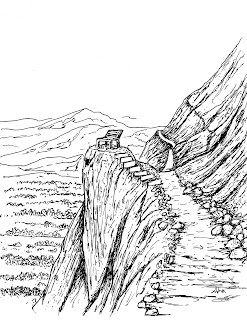 The footnote for the page is the scripture reference of Exodus 34:35, “The people of Israel would see the face of Moses, that the skin of Moses’ face was shining.” It is about the time when Moses met with God on the mountain and his face was full of the brightness of having been in communion with God. You can read this poem on page 9 of the book. If you would like to read a sample poem choose the link below for the website.